Good morning and happy hellos from Green Bay WI!!! I'm having a wonderful time with my peachy design sisters, Lisa and Viv, and we're adding Janice to the mix today, and I can't wait for that!!! Even with all the fun going on here, we've got to think about challenge day, (Let's face it... THAT'S one of our favorite things) and this is the day for another fabulous sketch and a new challenge with it. Boy, was this image from the new Fall Blessings Acorn stamp set PERFECT for this sketch! I used some of my stash of PTI patterned paper for this card, and did a little bit of embossing on the horizontal panel behind the image. That is the striped embossing folder from Stampin' Up!. I love that thing, and use it a lot. The image was stamped with Memento tuxedo black in and colored with Copics. Divine twine in chocolate brown finished this card off, and added the final element for the sketch. October 17th through October 19th! Don't forget to drop by the challenge blog to check out all the fine details of the sketch and of course the fantastic inspiration that our design team has created for you. The very talented Heather from House Built of Cards is guest designing with us this week, and she's sharing some creative and beautiful works on the home blog as well. Drop by and leave her some love, not only for the inspiration, but for a chance to win a great prize, too. SPEAKING of prizes, don't forget our blog hop (going on now), because there are a BUNCH of $15 gift certificates available to win. Just hop along and leave a comment for your chance to win. Below is a list of stops for the blog hop, so that you can find your way. Thanks for stopping by today! Have fun!! Have a blessed day and happy stamping! Super cute card-I love the coloring! Love the card, it is too funny!! Toooo cute! I was not sure about this stamp set but you have definitely changed my mind - love it! I just love the acorn set. Thanks for great ideas. I love your card! It looks amazing! What a fun card, love the colors of fall!!! Love the card! 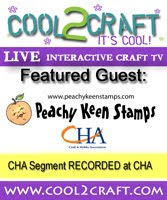 Lorie, congrats on your intro at Peachy Keen Stamps!!! I'm heading over there now to check it out! This is my fav. of the newest released stamps! Love the coloring on the leaves! LOVE your acorn card! It's perfect in every way! Your coloring is amazing and I love the paper you picked!! Gorgeous!! !